Ryanair has won the dubious honour of the UK's least-liked short-haul airline for the sixth year running. The results from a Which survey of airline passengers ranked Ryanair at the bottom of 19 carriers flying from the UK. A Ryanair spokesperson said the airline's success was not reflected in the survey. The best performers were Guernsey-based Aurigny Air Service, Swiss Airlines, Jet2, Norwegian and Dutch carrier KLM. The UK's other large airlines, Easyjet and British Airways came in at 11th and 15th, respectively, in the survey. Which said "thousands of respondents" said they would never fly the airline again. "Ryanair still represents great value for a huge amount of people. What they receive is what they expect." Mr Tarry said the airline had endured "a tough year" but still generates "huge amounts of cash". "Painful lessons have been learnt," Mr Tarry said. 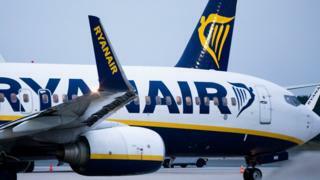 A Ryanair spokesperson said: "Ryanair passenger numbers have grown by 80% in the past six years and Ryanair.com has become the world's most visited airline website. "These facts reflect what customers want much more than an unrepresentative survey of just 8,000 people."